My dear friend Gary is retiring from teaching this year. I believe he’s taught 30 years. Wow. This is my 7th year and sometimes it feels like I’ve been teaching 30 years and sometimes it feels like I’ve been teaching 1. Such dedication he’s had with his students and in his profession. Anyway, I wanted to honor him, so I decided to make some lemon cupcakes (which I will be making today and bringing them in to work tomorrow) with these fondant toppers. See, Gary is also a professional actor and those who have attended his plays have thoroughly enjoyed watching him in his element. 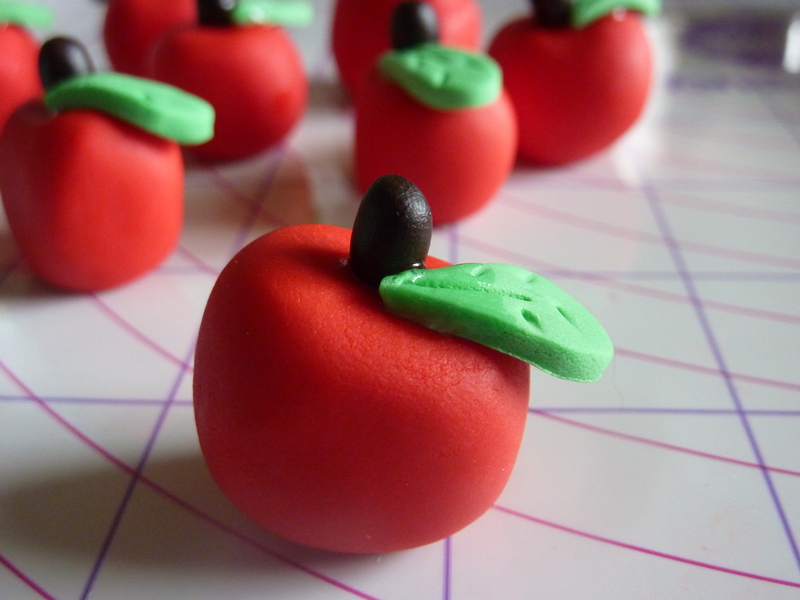 I thought about making small items that you would find on a typical stage, but couldn’t make them small enough for the frosting to support them, so I went with a teacher theme–apples, books, and a bookworm. When making figurines, I like to use Tylose powder, to keep the fondant hard when it dries. (I don’t use them when rolling out for cake.) Just a little will do. Use a leaf cutter to cut out the leaves for the apples. Then use a toothpick to create veins. I use piping gel to “glue” the parts together–the stem and the leaves to the apple. Then I made the book. I made a bookworm but it didn’t turn out. The antenna looked funny. So I made flower toppers instead, but looking at it, they look like stars. Oh well. Once the fondant dries, take an edible marker and write on it. Make sure you give them enough time to dry. Because these ones are thicker, I am giving them 48 hours to dry. If you don’t allow enough time, your fondant will begin to “sweat” on top of the cupcakes, bleeding the color through to the frosting and causing the fondant to wilt and become really soft. No bueno, for sure! As soon as I make the cupcakes, I’ll show you what the finished product looks like.